Here's why: Ordinary "tamper-proof" screws on the market are beaten easily by the millions of imported bits that are in circulation. Patented head styles available for nearly any fastener type. If it has threads, we make it. Security fasteners are our only business. The most trusted security fasteners on the market. "I've bought thousands of Bryce security screws for our pull-box products that secure buried copper wiring. To date, we haven't had a single reported breach. None. I attribute that to the fact that Bryce fasteners aren't sold on the open retail market and they're engineered to repel every knock-off tool out there. Nothing comes close to the security offered by the Bryce products." Perfect for jails, security fencing, solar panels, steel buildings, etc. where tamper-proof is needed but when high volume requires fast assembly. All tamper proof screws are not created equal. The problem with most other security screws is that they are not actually as secure as one might think. The fact is, except for Bryce fasteners, most so-called “tamper proof screws” aren’t tamper proof at all. Anyone can go into almost any hardware store and buy drivers to screws most people believe are secure and tamper proof. There are even commonly available drivers to remove those so-called “one-way screws”. So what is your alternative? Truly unique tamper proof screws made by Bryce Fastener. Bryce is a U.S. custom screw manufacturer located in Phoenix, Arizona. The vandal proof security screws, tamper proof bolts, tamper resistant screws, security nuts and other security fasteners Bryce manufactures are simply the finest in the world. 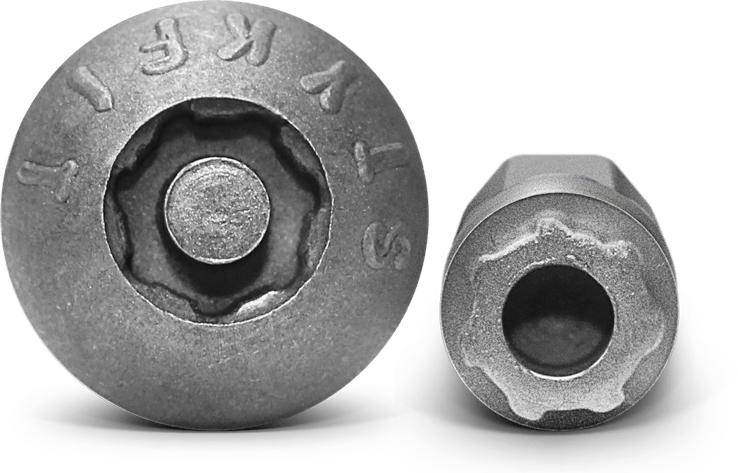 Tamperproof security fasteners is all we manufacture. Virtually every industry, from retail stores to governmental security has issues with theft, loss prevention and vandalism. Many of them, after suffering serious losses, put an end to their issues with Bryce Fastener’s tamper proof screws, nuts, and bolts. Many electronics manufacturers and product engineers need affordable, effective means to tamper proof components from prying hands, tools and eyes. They find the Bryce Key Rex security screws and security nuts nearly 100% effective in their applications, down to the tiniest of screw sizes. This is essential in protecting themselves from liability. It’s also important when they need to keep proprietary information out of the hands of others. Retail organizations need simple, effective, affordable means to prevent loss from theft and vandalism of their products and premises. Bryce vandal proof security fasteners have prevented countless cases of loss and vandalism at stores around the world. Universities everywhere protect costly classroom equipment with the world’s finest and most unique anti-theft security screws, tamper proof bolts and nuts made by Bryce. Time after time, we receive reports from schools when they discover all the screws removed from a securing device except the one or two security bolts from Bryce. Those one or two bolts were all that was needed to prevent costly items from being detatched and carried away. Utility companies rely on Bryce tamper resistant screws and tamper proof bolts to prevent theft of expensive equipment such as miles of copper wire. They also rely on large numbers of Penta Bolts and tamper proof screws from Bryce to effectively prevent manhole covers and other access points from being breached. Bryce security screws should be your best first line of defense against loss, theft, unauthorized entry and vandalism. Bryce manufactures some of the only truly tamper proof screws in the world. If Bryce doesn’t have what you’re looking for, give us a call. 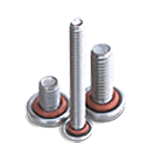 We custom design and manufacture screws and other security fasteners to fit almost any need.